Wrapping up this week’s triple feature is one of my favorite geology words: peridot. A peridot is a gem-quality olivine [(Mg,Fe)2SiO4], a beautiful green mineral found in mafic to ultramafic rocks. My engagement stone is a peridot– my fiance was pleasantly surprised that my favorite gemstone is among the cheaper gemstones. Though far less durable than diamond, I love the brilliant green color of peridot. These are just a few of the many examples of gems with both gem names and mineral names. Note how some minerals have multiple gem names depending on their color. Makes learning geo lingo a little more difficult, doesn’t it? To be fair, some of the gem names undoubtedly originated before the mineral types were discovered/invented. Also, while color is usually a poor way to identify a mineral, color is very important for gemstones. Thus, it makes sense that some minerals such as corundum and beryl (which come in many colors) have multiple gem names. Interestingly, diamonds are always diamonds– no matter the color. I love emeralds, but they are so crazy expensive. I work with a lot of gemstones with my jewelry making (mostly semi-precious) and the woo surrounding gemstones never ceases to amaze me. Every stone has all these magic powers and people take them so seriously that sometimes get really frustrating when shopping for them. How do you pronounce “peridot”? I’ve been wondering that ever since they added such items to World of Warcraft. I’ve been pronouncing it (in my head) as “pear-ih-doh” since it looks kinda French. That is a really pretty mineral! I love minerals. I’ve always been more interested in them than gemstones. I’ve never been much of a diamond fan, too commercial for me. I like unique stuff. The more unique the better. Red, green, and black colored minerals are my favorite. @Bevans: The word does come from the French. But there is a peridot paradox: Both PEAR-a-dot and PEAR-a-doe are acceptable and commonly used pronunciations. @Bevans: that’s pretty much how I’ve always heard it pronounced. @Bjornar: thanks! Spelling error noted. @Bevans: I pronounce the t in peridot. That’s the way I’ve always heard geologists (at least American ones) pronounce it. 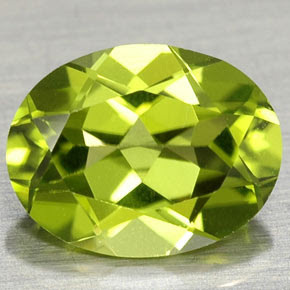 I do love peridot – that apple green color is just so unusual in gems, even considering the range of colors in minerals. I’m picky though – I haven’t found a piece of peridot jewelry I really love…yet…so I don’t own any. I like Opals, principally because they vary so much between individual stones. They seem different from those you list in that they aren’t or don’t seem to be crystalline. I’ve wondered whether or not they comprise some unique class of gemstone. Good article–thanks. Something else I didn’t know. Keep it up, Evelyn! so what’s the difference between a black diamond and a clear diamond? That’s pretty! I bet that if you put it into a dagger with sockets in it, then that dagger would do some awful poison damage! I’ve always preferred other stones far above diamond -and my husband, too, was thrilled to be able to choose a garnet for my engagement ring and to give me amethysts and (faux) blue topaz. A lot of the black diamond jewelry on the market today has been artificially heated under high pressure or irradiated. That doesn’t mean there aren’t naturally occurring gem quality stones, but naturally occurring, black diamonds have inclusions/impurities of graphite or iron, and gem quality stones are rare. Diamonds that are naturally pure are white, otherwise, most actually have a color of varying degree (hence the “color” of the 4C’s – many diamonds can have a yellow tinge to them, though a good setting and proper cutting can minimize it). If you’re referring to “carbonados”, though, they are kind of a mystery, and are actually an aggregate of lots of smaller porous diamond crystals and are totally f’d up. Lab-grown emeralds are fairly reasonable, and are less prone to the micro-cracks that, in natural emeralds, are temporarily concealed by immersing the stone in a hot, pressurized oil bath. If you are buying a gemstone faceted, instead of in its natural form, is there any reason to prefer a natural stone over a lab-grown one, especially if the lab-grown one is some combination of less expensive, larger, or better quality?